IPO staff welcome the opportunity to assist you in making your decision to attend Augustana or study abroad and are experts in student visas, financial support and more. 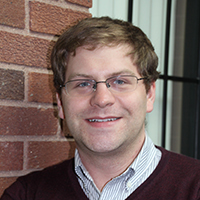 Ben hails from Willmar, Minnesota, and graduated from Augustana in 2004 with majors in Spanish and international studies. As a student, he was a pitcher on the Vikings' baseball team and studied abroad in Spain. His first "real job" was working in the international office of Nord University in Norway. In 2013, he completed an M.A. in international education from the SIT Graduate Institute in Brattleboro, Vermont. In prior roles at AU, Ben served in the Office of Admission and the International Programs Office, where he first traveled throughout Minnesota and then across the globe to speak with prospective students about AU. Most recently, Ben served as the Director of University Partnerships for ELS Educational Services, Inc.
Ben enjoys following the Minnesota Twins and doing nearly anything outdoors including fishing, hunting, running, cycling, and spending time at the lake and traveling with his wife, Stephanie, and son, Will, Augustana Class of 2037. 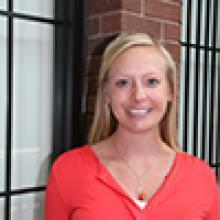 Erin earned her Bachelor's degree in Human Development and Family Studies from Iowa State University in 2004. She completed her Master's in School Counseling from South Dakota State University in 2007. For five years, Erin worked as an elementary school counselor in Dell Rapids, S.D. In 2012, she joined the International Programs Office. Erin has studied abroad as an undergraduate in Australia and France. She continues to travel and enjoys learning about culture. Originally from Scotland, South Dakota, Wade graduated from Augustana in 2008 with a major in business administration. As a student, Wade was actively involved as a member of the Augustana Choir, intramural athlete, Viking Varieties emcee, and New Student Orientation (NSO) leader. Finding himself inspired to explore the world, Wade studied abroad for a semester in Prague, Czech Republic. He also traveled to Tanzania as a member of the Augustana Choir. Jessica earned her B.A. degree in government and Spanish from Augustana in 1999. During college, she studied abroad in both Russia and Spain. After college, she worked for Senator Tim Johnson for 3 ½ years, completed a TOEFL certification at Hamline University, and then taught English as a second language in Hungary for a year. Upon returning to the U.S., she returned to Augustana to complete a Masters in Teaching. She then taught for three years at Vermillion High School, and eight years at O’Gorman High School, teaching both Spanish and social studies. Jessica began working at Augustana in 2017. Heather earned her B.A. degree in history and government from Lawrence University in 2002. After college, she participated in the Japan Exchange Teaching Program between 2002 and 2005. She completed her M.A. in Secondary Education from Johns Hopkins University in 2008. Heather worked as an English teacher at Roosevelt High School for three years, duties including teaching English as a Second Language immersion students and advising the newspaper. Heather studied abroad in the U.K. while in college and has travelled to over 20 countries. She continues to travel abroad with her three boys and husband. Heather began working at Augustana in 2018. Philip earned his B.A. degree in government and international affairs from Augustana in 2010. He then started working in higher-education at United International College – a new liberal arts cooperation between Hong Kong Baptist University and Beijing Normal University in Zhuhai, China. There he lectured academic and general English courses for five years. Besides lecturing, Philip also examined for the British Council and trained local teachers. His world travels include more than 12 countries with a focus on China, having explored over 20 provinces and major municipalities there. His international experience continues to develop back at Augustana University, where he joined the IPO staff in 2015.